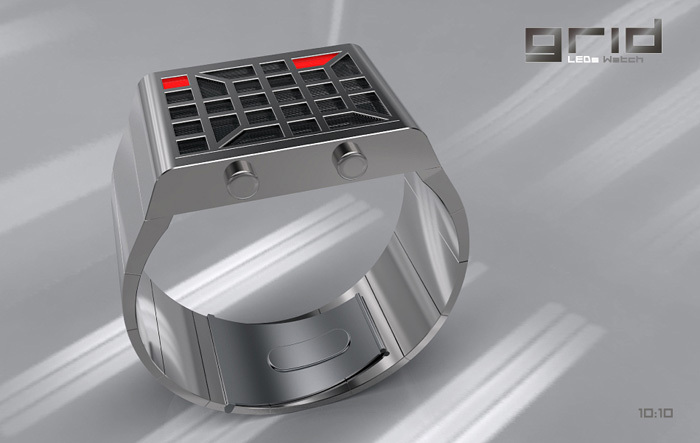 Its operation is the same one as GRID-Watch-LCD, the circumference of the watch gives the hours like an analogue watch. The low part of the dial, they are the minutes, from 10 to 50 minutes and the center of the case, the additional minutes from 1 to 9 minutes. The activation and programming of the watch, this fact via two buttons on the right-sided of the case. Stainless steel case and clasp. 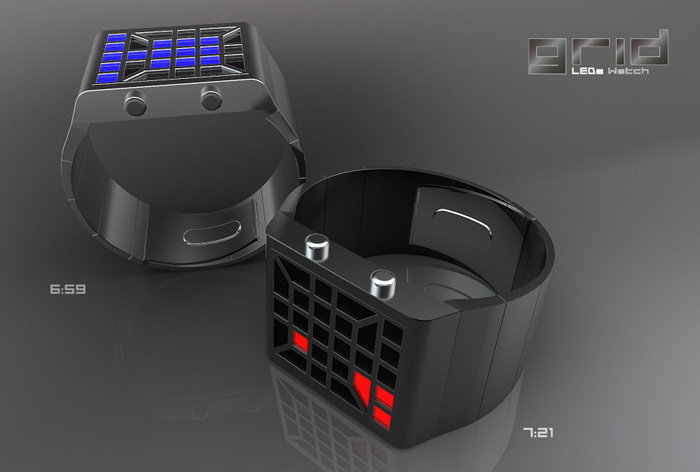 GRID-Watch-LED is for an audience that likes watches original gadgets and sober, with a reading of the different time and unique, very easy after initiation. 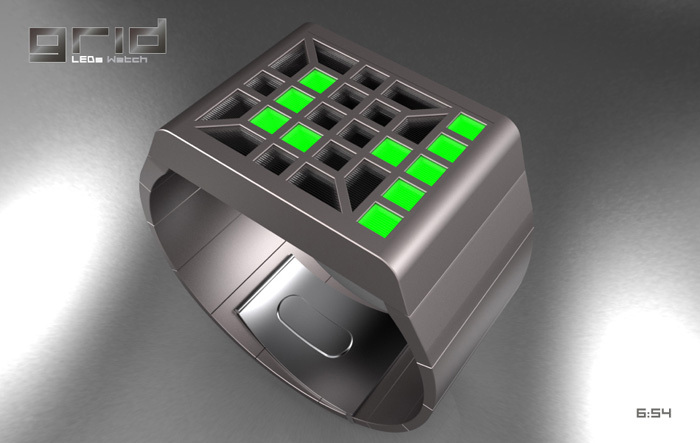 This entry was posted in Design Submissions and tagged Bracelet, cryptic, grid, LED Watch, squares, unisex. Bookmark the permalink. Beautiful work as usual Patrick. 😉 I really hope TF make this or another one of your designs this year. I especially like the geometric look of the display which is easy to read yet different enough in appearance to make it intriguing. For me, it has that certain “je ne sais quoi”. 😀 Good luck with it mate. Hi mu5hroom, thank you for your nice comment, maybe one day I will also have the chance to see one of your beautiful built projects? I think this LED version actually looks better than the LCD. I find the “chunkier” look more appealing. 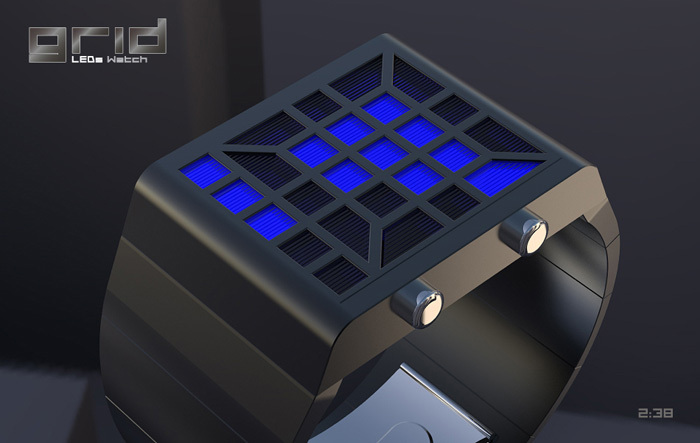 Having a multi colour LED option, like a couple of the PIMP watches could make it a bit flashier, and easier to read for some people; just a thought. This is a great design. Good job. Mb500sel thank you for the thought and appreciation. I like both versions, Patrick. The “always on” side of the LCD is always appealing, but the LED brings the option of multiple colours. Great design, as always. Now the blog is active again, I hope we will see more from you. Hi Nev, thank you for the nice comment, it is pleasant. Cheers and best chance for you and the friends of the blog. Hi Pete, thank you for your comment always very sympathetic nerve. The first watch which allured me on the site of TF, it is the “Barcode”, with much of spectacular LEDs and animations with only one color for a relatively complicated reading, I am not certain to add colors would bring some thing moreover to the look voluntarily enigmatic of this watch and yet very simple to read? I like the case very much!! Chunky, bold, tough. The time telling method is okay, a bit looking like a traditional Toky display. The angled LEDs break up the strict look and so the time display sometimes looks more exciting. But it’s not sooo super new. Maybe color change mode and different time telling methods would fit in there. Hi Sam, thank you for your comment. What I try to do is that with a minimum of information, you can have the exact time. Of course, all variants would also be interesting. I prefer the LCD version, for being always on. That being said, the cut-out grid here is nice & having an animation that show Hour > 10min > 1min help with the reading/initiation. It could be done with 3 colors. I like that the hour is analog & the minutes are on rows. The first version of this watch (LCD) is more elegant and the fact that it is “always on” is interesting, but I also like the LEDs, so now he has a choice. For the three colors, I felt that reading was easy, but given the previous comments, so why not?